We all know that until 1870 Italy was a peninsula of Europe divided into various unequal-sized States. Some of them were republics, like Venice, but the greater part was composed of monarchies. Among the latter, three kingdoms stand out: the Kingdom of Piedmont-Sardinia, the Kingdom of the Two Sicilies, and the most important one, the Kingdom of St. Peter, the Papal States. The Papal States were made up of territories that came from various donations to the Patrimony of St. Peter through History. 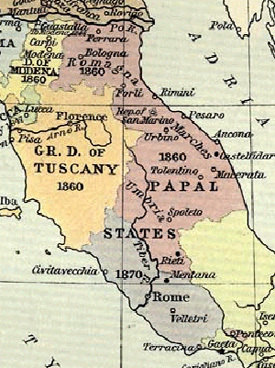 Before 1870 the Pope was the ruler in the civil as well as spiritual spheres of these territories, which formed a strip in the center of the Italian peninsula extending from the Adriatic to the Mediterranean. Its capital was Rome. After Rome, the most important city in the Papal States was Bologna, due to its prestigious university and important ecclesiastical life. Before the unification, the country of Italy as we know it today did not exist. Metternich, the famous Austrian statesman, used to say that the name Italy was just a geographical reference point encompassing those exuberant units full of life and personality, each one of them singular and with its own political interests. For this reason, the name Italy had only a geographical and cultural significance. From about 1830 on, a movement started to unify all those States into a single nation. It was led by the Princes of the House of Savoy – the Dukes of Sardinia and Savoy – based in Turin. Their action had the full support of Masonry. The Savoys wanted to bring all those States together under their scepter. This Monarchy planned to expel the Bourbons from the Kingdom of the Two Sicilies, and the Habsburgs from Lombardy. Lombardy had the famous Iron Crown built around one of the iron nails used at Christ's crucifixion. They also planned to annex Venice, Genoa, and other small Italian States. After this plan was achieved by means of many different revolutionary measures, they finally waged a war to take over the Pontifical States. That fight was dramatic. The Church always considered every Pope, by divine law, a sovereign King, with absolutely no temporal power in the world above the Pope. It is good to note that we are not speaking here of any power being superior to the Pope in the spiritual sphere, because it is evident that this is impossible. Rather, we are talking about his temporal jurisdiction. Those territories were necessary for the Pope to maintain his independence to carry out his supreme mission. It was necessary for him to have and govern those territories as their sovereign in order to maintain his spiritual independence. Hence, it was indispensable that the papal power should govern that strip of land. Should a king usurp those territories, the Pope would have to leave them so as not to be subordinate to another temporal power. Both Masonry and the Savoys knew this quite well, and their goal was to force the Pope to hand over those territories. They wanted to seize not only the Pontifical Territories, but also Rome, so that the Pope would either be expelled from them or have to accept their temporal power over him. In the latter case, the Pope would have to tacitly deny that this temporal sovereignty of the Papacy is an essential part of his mission. So, over and beyond the problem of whether or not it was good to unify Italy, another much more important question was at stake. 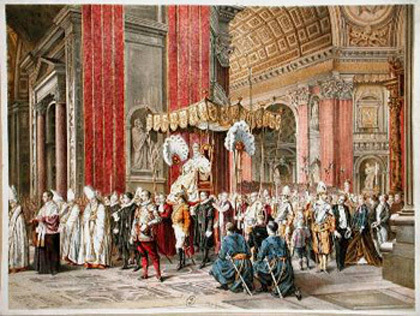 In that 19th century characterized by successive waves of anti-clericalism and every kind of Protestant, Masonic, and atheist anti-Catholic campaigns, could the Holy See still count upon Catholics to defend it if it were overtaken by the armies of Victor Emanuel and Cavour? This was a vital question for the Holy See. The Pope during this crucial period was Pius IX, famous for his admirable vigor and tenacity. He was the Pope who defined the dogmas of the Immaculate Conception and Pontifical Infallibility. He was the one who fought the enemies of the Church throughout Europe. He led Catholics in this fight and encouraged them to act in the social and political fields to counter-attack the anti-Catholic efforts of the Revolution, and to make their countries stop supporting the destruction of the temporal power of the Holy See. This was, indeed, a dramatic international fight led by Pius IX. 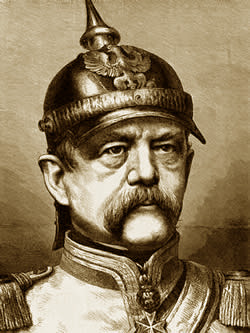 The leading figure in the Revolution of that time was Otto von Bismarck, the chancellor of Prussia. He was the mentor of the German First Reich, the man who unified Germany under the boot heel of Prussia. Bismarck tried to destroy the Catholic Religion in Germany through a series of sanctions whose pretext was to secularize the country – he called it Kulturkampf [the fight for culture]. Under the leadership of Pius IX, the Catholics rose up in a reaction and obliged Bismarck to step back. They smashed the man that until then no one had been able to defeat. The major newspapers of the time were almost all enthusiasts of the enemies of Pope Pius IX. They glorified the King of Italy, Giuseppe Garibaldi, Cavour, Mazzini, and other architects of Italian unification. Thus, Pius IX was facing not only military troops attacking his Pontifical States, but also the ensemble of a powerful international media. In that epoch, newspapers were an extremely popular novelty, with a much greater influence than they have in our days. Before that compelling colligation of revolutionary forces, the most powerful kings would bow and retreat. It was against this colligation that Pius IX launched his fight, his defense against the invaders of the Papal States. His situation could not be more critical, because the Papal States only had a small number of soldiers. Many Catholic countries like Canada and Brazil sent volunteers to fight for the Pope. But those reinforcements were only symbolic. The great military support for the Pope was the French army, sent by Napoleon III to the Papal States pressured by the French Bishops. At that time, France still had a faithful Catholic Episcopate. Pius IX did not waver in his decision. He proclaimed the dogma, and some days later the threat was fulfilled, that is, Prussia invaded France, with the predicted consequences. To favor the conquest of the Papal States by Victor Emanuel and Garibaldi, Bismarck launched the Franco-Prussian war. 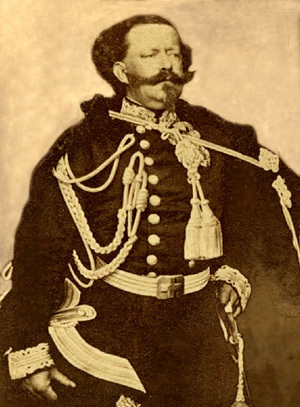 Napoleon III, who was not faithful to the Church, used this as a pretext to call back his troops, thereby abandoning the Papal States, leaving them unprotected. Soon afterward, Garibaldi would enter Rome and conquer the city. Thus, Pius IX proclaimed that dogma in the most adverse circumstances. He had no fear of the enemy. Catholics around the world applauded the new dogma enthusiastically. Then he lost his territories; he lost Rome; he lost the Quirinal, his personal palace, and he became a prisoner in the Vatican. To protest the usurpation of his territories, the Pope declared himself a prisoner in the Vatican, and never traveled again. What happened after that? One might say that the Devil wasn’t expecting the results that came and probably became terribly irritated. 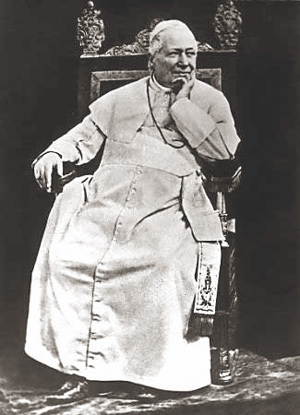 After this action of Pius IX, an unimaginable wave of enthusiasm for the Papacy flooded the Church. From all over the world donations flowed to help the Pope maintain the splendor of his pontifical court. Pilgrimages to Rome became much more popular. People would go to kiss the feet of the Pope, to receive his blessing. He could often be seen at the Vatican Basilica in his sede gestatoria in the full papal splendor. Some historians sustain that after the dogma of the Pontifical Infallibility was proclaimed, the Pope acquired such an extraordinary degree of power over Catholics, and through them, over the politics in their countries, that it was comparable to the power of St. Gregory VII. We know that in many ways St. Gregory VII represents the apex of the temporal influence of the Papacy in History. 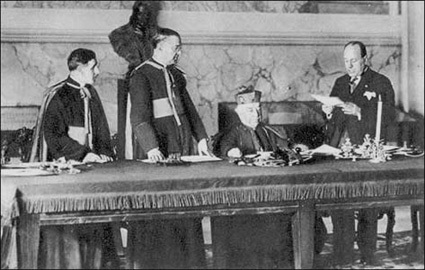 The power of the Holy See expanded so much both inside and outside of Italy that in 1929, Pius XI signed the Lateran Treaty with the Italian government. According to its terms, the Holy See received financial compensation for the loss of its territories and property. Also the full sovereignty of the Pope as sovereign of the Vatican State was recognized. In exchange, Pius XI gave up the Pontifical Territories under the allegation that the power of the Papacy had became so widespread and strong that it no longer had to fear any attack against it. The grandeur of a Catholic soul cannot be defeated by anyone or anything. At times it suffers transitory defeats that results in even greater victories. Pius IX is an incomparable model of this for us. How tremendous is the transitory victory of the Revolution in the Church today! Then, how magnificent will be her victory! This is the victory toward which we march. Looking at the example of Pius IX and with our eyes fixed on Our Lady, we can be sure that the victory will come.